Before we get into Fedex, let's review the markets. S&P 500 fell just one basis point on Tuesday, but there were wild swings during the trading session as investors prepared their portfolios for the Fed meeting on Wednesday. From the peak at 12:15pm to the trough at 3:45pm, stocks fell 0.92%. There was a weird moment from 12:45pm to 12:50pm where the S&P 500 fell about 10 points. It was like a very small flash crash where the algorithms decided all at once to sell stocks. Stocks recovered part of their losses before selling off further in the afternoon. The other indexes mostly did worse than the S&P 500 as the Dow fell 0.1%, the Russell 2000 fell 0.57%, and the Nasdaq increased 0.12%. 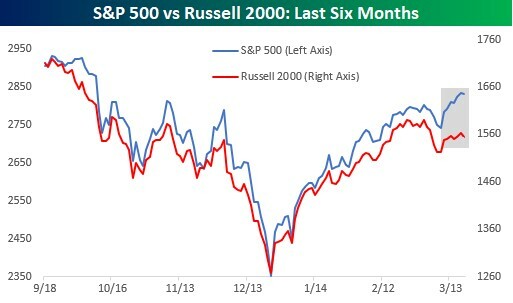 As the chart below shows, the Russell 2000 has underperformed the S&P 500 in 5 of the past 6 days. The VIX was up 3.51% because of the big swings. It makes sense to be long volatility because of uncertainty about the Fed meeting. Usually stocks go up on Fed days, but since I think the Fed will guide for no hikes in 2019, it will be more hawkish than the Fed funds futures market which is starting to expect a rate cut this year. Even though the S&P 500 only fell one basis point, there were only 3 sectors up on Tuesday. Healthcare and consumer discretionary were the best performers as they increased 0.78% and 0.5%. In the past few months, the relationship between consumer discretionary and utilities has suggested investors need to worry about the economy. The worst two sectors on Tuesday were the utilities and the financials which fell 1.18% and 0.76%. As you can see, the trend of utilities outperforming consumer discretionary didn’t continue. I’m not surprised the financials were down because yields have been falling and the curve has been flattening. On Tuesday, the yield curve flattened differently than it recently has as the 2 year yield increased 2 basis points to 2.47% and the 10 year yield increased 1 basis point to 2.61%. That makes the difference between the two rates just 14 basis points. The curve is close to its flattest point of the cycle. I expect an inversion unlike some economists who think the curve’s flatness troughed in early December. FedEx stock fell 5.72% after hours on weak earnings. This signals global trade growth is weak. The firm reported EPS of $3.03 which missed estimates for $3.11. Revenues also missed estimates as they came in at $17.01 billion which missed the consensus of $17.67 billion. EPS was down from $3.72 last year, but revenues were up from $16.5 billion. The stock fell because full year 2019 guidance was lowered for the second time as the range is from $15.10 to $15.90 which missed estimates for $15.97. The firm expects fiscal 4th quarter EPS to be between $4.58 and $5.38 which missed estimates for $5.39. FedEx’s executive Vice President stated, "Slowing international macroeconomic conditions and weaker global trade growth trends continue, as seen in the year-over-year decline in our FedEx Express international revenue.” This weak quarter and guidance could send the overall market lower since the firm is viewed as a bellwether for the economy. It’s debatable if the S&P 500 is in the bull market that started in 2009 still because it fell 20% in late 2018. However, this is still some sort of run since the returns since March 2009 have been fantastic and there hasn’t been a recession in about 10 years. 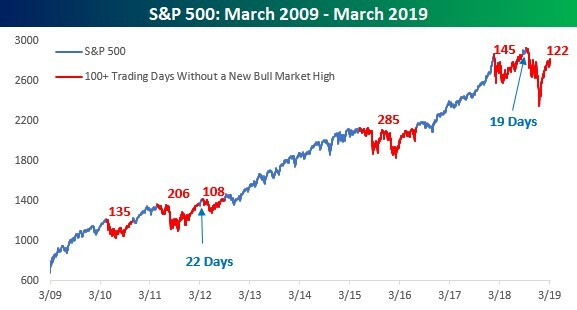 The chart below reviews each correction since 2009 where the bull market experienced 100 or more days without hitting a record high. There have been 6 such periods. The current situation is close to the 2011-203 period because there was a short period where the market hit a record high before it slumped again. It was 22 days in 2012 and 19 days in 2018. The fact that the S&P 500 only slightly surpassed the January peak makes the perma bears look like they have been right for a longer period. The combined current period is 267 days which is shorter than the 2011-2013 period which was 314 days. It is also shorter than the 2015-2016 correction. Since the S&P 500 is a few percentage points away from hitting a new record, I could see the combined period beating out the 2015-2016 correction, but not the 2011-2013 one. I think the stock market is jumping the gun with this rally because the slowdown still has further to go which is different from the spring of 2016 when the worst of the economic weakness was over. However, it’s tough to be extremely bearish because I do think the slowdown will end late this year. Since the S&P 500 briefly fell 20%, we can also compare this period to other quick bear markets where stocks reached new highs soon afterwards. 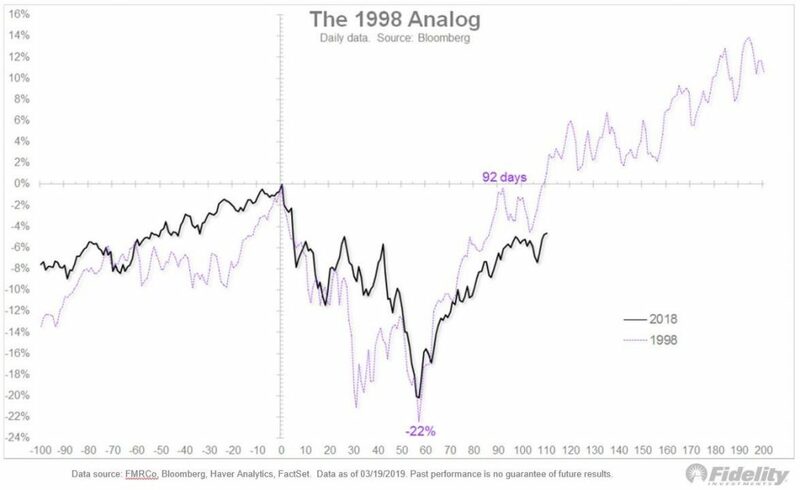 As you can see from the chart below, the S&P 500 fell 22% in 1998. The time from when both markets peaked to when they troughed was almost identical. The 1998 market recovered quicker than this one. It’s hard to imagine stocks rallying faster than they have in Q1 2019, but they did in 1998. It’s a valid comparison in my opinion because the economy could easily be 2-3 years away from a recession. This market is also cheaper than the late 1990s market was. The current Shiller PE ratio is 30.49; in July 1998 it was 38.26. This slowdown will probably be worse than 1998, but it’s tough to tell because economic growth hasn’t troughed. In the summer of 1998, the 4 week moving average of jobless claims hit 352,000. If the 4 week average of claims hit that level in Q2 2019, investors would be screaming for a recession. The final similarity between the two markets is that in 1998, there hadn’t been a recession for a long time (about 8 years) and now the economy is about to surpass the length of the 1990s expansion.